Do you love food but hate tables and chairs? Do you want lunch but believe that a $19 Sweetgreen salad violates your constitutional rights as an American? Good -- you’re here, among friends. 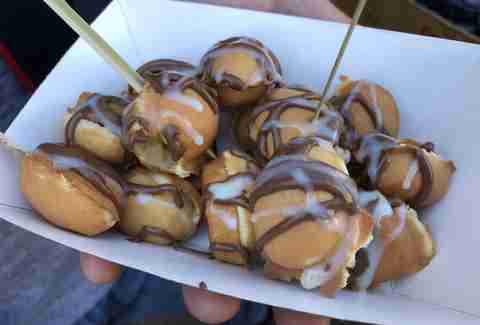 Now that the bougie food truck craze is nearly dead (presumably joining the cupcake, fro-yo, and rainbow bagel crazes in hell), we can appreciate all the actually great food trucks and carts the city has always had to offer. 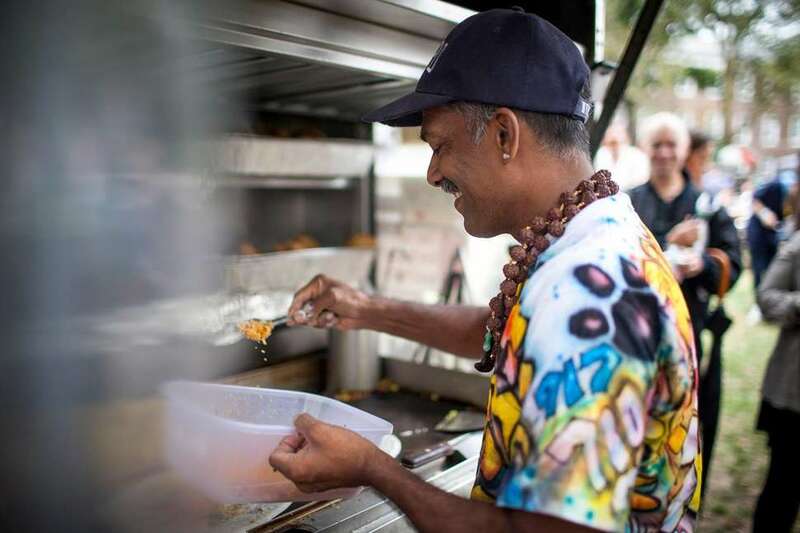 Forego the cutesy cultural mashups and forget the “phone eats first” philosophy -- the best street food is made by people sweating their hearts out over a hot griddle. I’ve rounded up my 11 favorite carts, trucks, and stands in the city, many of which have long been slinging 6-buck lunches while the fads come and go. So do yourself (and the city) a favor; skip the raindrop cake and go straight for the good stuff. 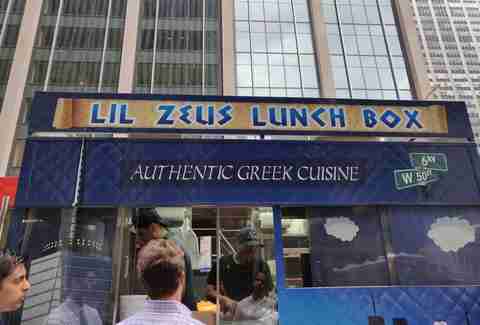 As beloved by construction workers as it is by local bros in their Midtown Uniforms, this little blue truck has lunchtime lines that meander down the block. The wait for its Greek food is well worth it: The lamb pita is rich, pillowy, and doused in white sauce; the souvlaki platter with rice keeps you full past your 3pm chocolate cravings; and the Greek salad makes you want to punch whoever started Chop’t right in the face. Treat yourself to the fries if you have an afternoon meeting you’d prefer to sleep through. If I could marry these tacos, I would. (The future liberals want!) This truck spawned the brick and mortar Tacos El Bronco restaurant, and both are highlights of any Sunset Park taco tour. Tender lengua, sweet pastor, and crisp, fatty cabeza are among the best of the best. Everything’s served with a handful of cilantro and raw onions, a side of pickled veggies, and a squeeze of fresh lime. It’s the kind of food you’ll want to wolf down while sitting on an overturned milk crate or leaning against a wall, your head tilted towards the taco so you don’t spill a drop. Meat -- pork, beef, squid, shrimp, lamb, and more --on sticks. Meat on sticks! The men in this cart send a plume of smoke up through Flushing as they char the kebabs on the grill. (Stand clear, or risk smelling like a bonfire for the rest of the night). The meat is crackling, the sidewalk is full of customers, and you can get way too full on five bucks. They’re open late, and best enjoyed after a few beers in the neighborhood. If you order your meat extra spicy, as you should, you’ll want a beer after eating your meat sticks, too. 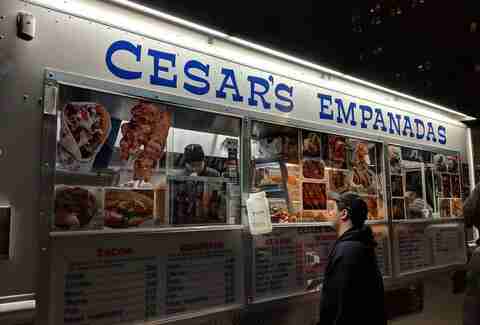 Near the Barclays Center, City Point, and the Apple store, this empanada truck sits stubbornly, steadfastly, where it always has. Lucky us -- the empanadas are about $3 each, gold with oil, fat with filling, and ready to be dunked in spicy green sauce. If you’re still hungry after your feast, Cesar’s serves up solid tacos, too, and guava-and-cheese empanadas for dessert. They’re just the thing to steel your nerves before spending $160 on AirPods. With no English signage and a plain metal facade, this cart is easy to miss but well worth looking for. 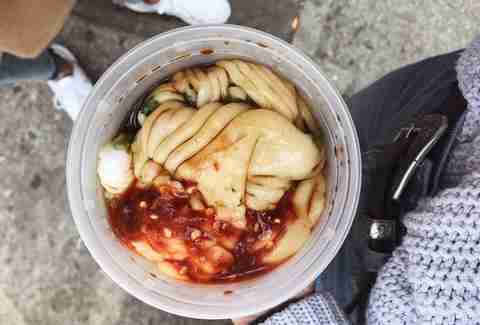 Cheong fun, a traditional Chinese comfort food, is long, flat steamed rice noodles topped with meat and a sweet-salty sauce to create a silky, unctuous snack. They’re best slurped in the winter, as a reward for waiting in the cold, but they satisfy in the summer, too. Get there early -- like, breakfast time -- since they frequently sell out before noon. And as always, those who know ask for extra spicy sauce. As far as I’m concerned, this is the final word on New York City street meat. 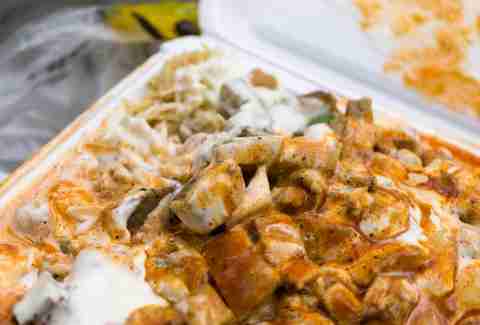 (Sorry, Halal Guys -- drunk me loves you, too). It’s rich and spicy, filling and greasy, and tastes exactly like being young in the summer in the best city in the world. Should you eat your lamb platter with white sauce and green sauce straight out of the takeout container on the train ride home? No, but you probably will, because it smells way too good to wait. The Puerto Rican delicacy lechon -- suckling pig -- is roasted long and slow by La Piraña’s neighborhood proprietor, who chops the cooked pork with his signature machete and then serves it up with rice and a garlicky sauce. Pastelillos are on offer, too, fried empanada-like pastries filled with crab, shrimp, beef, or chicken. If you do make the trip to La Piraña, deep in the Bronx, you’ll find it’s more than just a food stand; it’s a gathering place, and a taste of Puerto Rico for those who miss the island. Mini cakes experienced a surge of Instagram fame when Eggloo, a Mulberry Street ice cream shop, had the bright idea to wrap ‘em around a scoop, stick in a couple of Pockys, and charge you $9. Ling’s, on the other hand, serves fifteen of these eggy, fluffy cakes for just $1.50. You can drizzle them with condensed milk or get them filled with chocolate, but hot and crispy off the griddle, they’re just perfect on their own. This cart -- or rather, a window with a grill, in front of a bar -- serves up tortas as big as your head. Salty, stretchy Oaxacan cheese is melted with your choice of meat and fresh and pickled veggies, all sandwiched between soft white bread. Tortas Neza is famous for its gigantic “Tortas Pumas,” which staggers under the weight of two types of cheese, ham, eggs, sausage, chorizo, avocado, and breaded chicken. Bring a friend, because there’s no way you can take down the Puma alone. 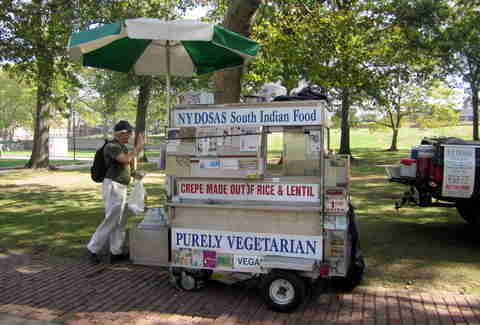 An NYU student staple, this vegetarian cart in the park serves up dosas -- a rice-and-lentil filled crepe, and a staple of south Indian street food -- along with crispy samosas and a quickly-sold-out selection of special lunches. If you just want a few samosas for the road, pop up to the window; otherwise, you’ll have to wait in line for your dosas with the rest of us. If you’re craving roti curry, jaffna, or one of the cart’s other specials, call ahead to make sure they’ve got it. The king is the king for a reason. Sure, there’s Van Leeuwen, with its black charcoal flimflammery, and Coolhaus, who, to its credit, serves a mean ice cream sandwich. But in the end, nothing says “ice cream truck” like a corn-syrupy cherry dip or swirl with rainbow jimmies. 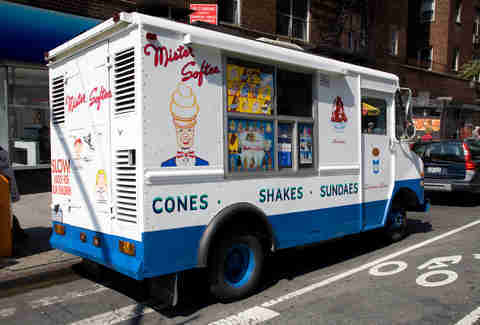 I like spending ten bucks on fancy ice cream as much as the next sucker, but let’s be honest -- there’s only one food truck whose song, lifting up from the street, can make adults run outside in their pajamas.